Feeling Bloated and Facing Problematic Skin? All of a sudden you feel bloated and you’re facing acne. These two are the common signs that your colon is probably clogged with toxins and waste products that are not flushed out from the intestines. In order to get rid of these problems, you have to focus on cleansing your colon. Aside from being bloated and acne problems, when you cleanse the colon you will also be able to free yourself from mental and emotional distress. A clogged colon is filled with toxins that may affect emotional, physical and mental health. By exercising regularly, eating healthy foods and taking supplements that are helpful can aid in easily clean the colon. Speaking of supplements, you just have to look for components such as Oat Fiber, Alfalfa, Aloe Vera and Psyllium Husk that is responsible for easy colon cleanse and Green Tea and Pu’er Tea which helps your body digest fat faster than normal. Each of these components have their corresponding health benefits that when combined, will result to proper detoxification and cleansing of the body. Oat Fiber helps in controlling the appetite which prevents you from intense and unnecessary craving, Alfalfa helps in nourishing the digestive system, Aloe Vera helps in cleaning the gut, Psyllium Husk makes you feel fuller for a longer period of time while making sure the digestive tract is cleansed. Green Tea on the other hand is popular for burning excess fat by speeding up the metabolism and Pu’er Tea is helps eliminate the fats that are hard to digest. Once you know a product with these components, take a hold of it these ingredients are helpful in keeping your gut healthy while making sure you’re fit! There are many brands but FatOut is the only supplement that contains all these components! 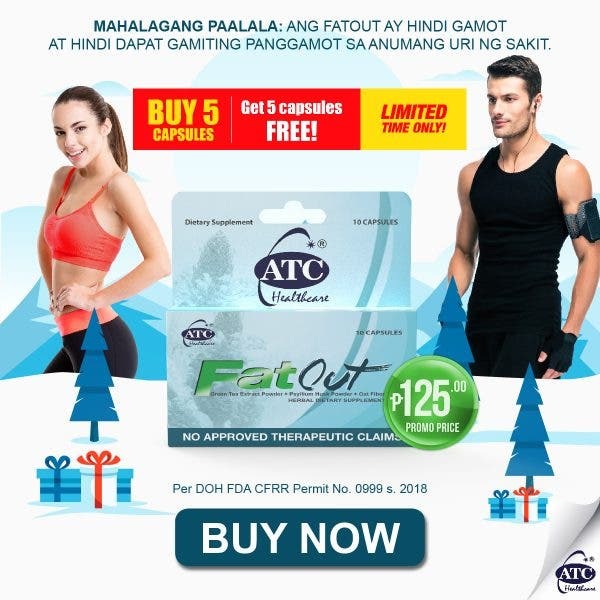 Talk of the town is that FatOut is now more affordable than ever with SRP 25.00 per capsule! With this new suggested retail price, cleansing is easier now. Head over to nearby Mercury Drug stores and check it out now.